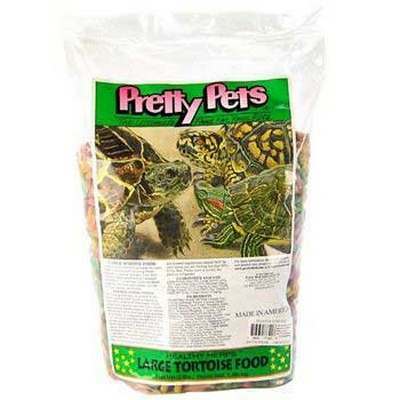 Pretty Bird Large Tortoise Food contains 8% protein, 3% fat and 13% fiber and is manufactured in multicolored nuggets that are eagerly accepted by all types of tortoises. These foods have produced excellent growth rates in our research animals. INGREDIENTS: Oats, Corn, Oat Hulls, Calcium Carbonate, Dicalcium Phosphate, Corn Gluten Meal, L-Lysine, Choline Chloride, Natural and Artificial Flavors, DL Methionine, Vitamin E Supplement, Ascorbic Acid (Vitamin C), Ferrous Sulfate, D-Biotin, Yucca Schidigera Extract, Zinc Oxide, Manganous Oxide, Niacinamide, Vitamin B12 Supplement, Mixed Tocopherols, Copper Sulfate, Calcium Iodate, Citric Acid, , Vitamin A Supplement, Calcium Pantothenate, Sodium Selenite, Folic Acid, Riboflavin, Pyridoxine Hydrochloride, Thiamine Mononitrate, Natural and Artificial Colors, Menadione Dimethylpyrimidinol Bisulfite (source of Vitamin K3), Vitamin D3 Supplement, Cobalt Sulfate, Rosemary Extract.